Black Friday 2015 - 25% Off Selected Wall Art - Simply apply the Voucher Code below at the Checkout this Black Friday! Don't miss out on our 1 day offer!!! Need a piece of wall art to complete a room? Whether you're redecorating or looking for the perfect gift for a loved one this season, we will have a vast collection of discounted wall art available to suit both traditional and contemporary interiors. 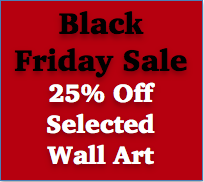 The Black Friday 25% discount will apply to all the following wall art categories; metal wall art, wooden wall art, resin wall art, glass wall art, rope wall art, canvas wall art and finally our 3D wall art. We have small and large wall art to choose from, depending on your preference. Please browse and start adding to your wish list today...enjoy! Bring out the Artist in You…Your walls are Your Blank Canvas!